Check out our birding itinerary here. And our full checklist of birds of the Bale Mountains here. Rated by the African Bird Club as the number four birding site in Africa, the Bale Mountains National Park is home to 310 species of birds. Furthermore, over 170 migratory birds have been recorded within the park. The Bale Mountains are home to almost every highland Abyssinian and Ethiopian endemic. Over 863 species of birds have been registered in Ethiopia, representing approximately 9.5 percent of the world’s birds and 39 percent of the birds in Africa. 18 of these birds are endemic to Ethiopia, while a further 14 are endemic to Ethiopia and neighboring Eritrea. The Bale Mountains are the best location in Ethiopia to spot the wattled crane, moorland and chestnut-naped francolins, and spot-breasted plover. There are also relict populations of three primarily Eurasian species that breed nowhere else in sub- saharan Africa: the ruddy shelduck, golden eagle and red-billed chough. Due to the diversity and density of rodents, the Bale Mountains are also an extremely important area for resident as well as wintering and passing raptors. Bale is an exquisite location for longtime birders as well as inexperienced visitors interested in seeing rare and endemic birds. Blue-winged Goose. Photo by Hakan Pohlstrand. 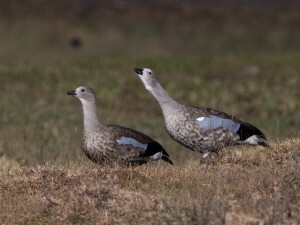 Classified as Vulnerable on the IUCN Red List, the blue-winged goose is the rarest and most isolated goose in the world. Easily spotted and commonly seen, they are found only in the highlands of Ethiopia on a plateau ranging from 1,500 to over 4,000m, in grassy meadows and pastures near rivers, lakes and marshy areas. Interestingly, their closest living relative is the sheldgoose (Chloephaga), native to South America. 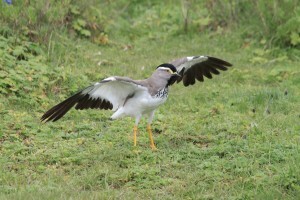 The spot-breasted plover occurs in the western and south eastern highlands of Ethiopia, above 3,050 meters in marshy grasslands and moorlands. Seen usually in pairs or small groups (or groups of up to 40 during the non-breeding season), it is widely distributed and locally common. On the ground, the spot-breasted plover dash- es and stops short; in the air, it swerves. It is a noisy bird; its call a “kree-kree-kre-krep- kreep-kreep”, or “kueeeep-kueep” and the cry “pewit-pewit”. In contrast to other plovers, it has fleshy wattles below the eyes and a black spotted breast. Breeding in April in the Bale Mountains, they nest in patches of grass and moss, digging small holes, each with up to four eggs. They are one of the least-studied plovers in the world. 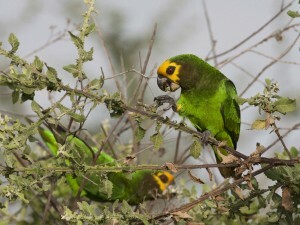 Yellow-fronted Parrot. Photo by Hakan Pohlstrand. The yellow-fronted parrot occurs in the western and southeastern Ethiopian highlands, western lowland forests and woodlands and in the Rift Valley from approximately 600 to 3,350 metres. They are most frequently spotted by listening for their loud, squeaky calls and “unmusical shrill whistles.” They are thought to feed on fruit, sorghum, maize and seeds, although very little is known about this species in general. They have suffered greatly due to habitat destruction. Abyssinian Longclaw. Photo by Hakan Pohlstrand. 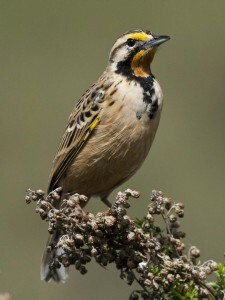 Although the Abyssinian longclaw is a common grassland bird of the western and southeastern Ethiopian highlands, it is classified as Near Threatened on the IUCN Red List. It inhabits areas between 1,200 and 3,050m, occasionally reaching grass moorlands of up to 4,100m, but is most common between 1,800 and 2,750m. It is most frequently spotted sitting on a rock, mound of dirt, small bush or fence either in a pair or alone. While perched, the black “necklace” and saffron throat are quite visible. The Abyssinian longclaw call is a clear and thrilling song with a piping call note. They nest in February and June through August and are considered to be “tame and friendly” while breeding. The nest is built on the ground in a cup shape and lined with grass. Abyssinian Catbird. Photo by Hakan Pohlstrand. Perhaps the finest singer of all the birds in Africa, the Abyssinian catbird is common in the western and southern highlands between 1,800m to 3,500m. It lives either alone, in pairs or in groups of up to eight individuals in dense thickets that surround forests. They are territorial, nesting from February to July. Their nests are made of plant stems constructed around vines, each containing two flesh coloured eggs with dark brown spots. They feed on juniper berries. During the rainy season, the male and female sing duets frequently. The male stretches out his neck while holding his wings out at the bend, producing a long, clear, ringing sound while the female responds with a purring note. 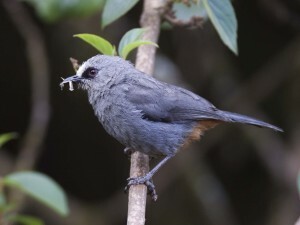 It is believed that the Abyssinian catbird is in fact a babbler, whose closest relatives may be the bush blackcap also known as the bush babbler of eastern South Africa. Black-headed Siskin. Photo by Hakan Pohlstrand. The black-headed siskin is a species of finch found only in subtropical or tropical high-altitude grasslands above 2,000 meters. Flocks of 50 to 100 birds can be seen. Black-headed siskins nest in low bushes or in hanging boughs in a well-made nest composed of roots and stems with a finer lining. They lay two to three eggs that are bluish white in colour with a few brown spots. They breed in May and June and again in September and October. Abyssinian Ground Hornbill. Photo by Hakan Pohlstrand. 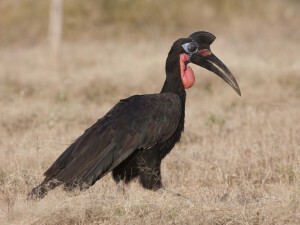 The Abyssinian ground hornbill is a large, turkey- like bird with black feathers, and a large bill with an open-fronted casque sitting atop it. Modified feathers form long eyelashes, which protect their eyes from dust. Males develop red on the inflatable throat pouch; the female’s pouch usually remains all blue. Typically they are 1m tall, weighing up to 3kg, with a wingspan of up to almost 2m. 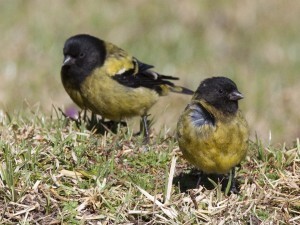 The birds are usually found in pairs, trios or quartets with young birds. They are slow breeders and do not reach sexual maturity until they are about four years old. The female produces two eggs, which she incubates for 37 to 41 days. The eggs are laid three to five days apart and hatch in the same time frame. The older chick usually grows so fast that the younger one cannot compete for food brought to the nest. The surviving chick continues to live in the nest for about three months. In the Bale Mountains, particularly in the lower section of the Harenna forest, they are commonly spotted in pairs. Called “humo” in Afan Oromo, but widespread throughout all of Ethiopia, it is believed that if one manages to cross between the hornbill pair they will be blessed with a long life. Wattled Crane. Photo by Delphin Ruche. The largest and rarest of the six species of crane in Africa, the wattled crane has been listed as Vulnerable on the IUCN Red List since 1994. Historically ranging across southern Africa, the species range has been declining over the last several decades. The population in Ethiopia is the northernmost in Africa. Of all of Africa’s cranes, the wattled crane is most dependent on wetlands, although in Ethiopia they are less so, making use of the montane grasslands, savannahs, wet meadows, streams and small lakes of the Sanetti plateau. Typically seen in pairs, they breed at the beginning of the wet season in May and June. They have the longest incubation period as well as fledging period of any crane – up to 36 days and 130 days respectively - rendering the chicks to particular risk of predation. They feed on aquatic plants, but will also eat seeds, spilled grain, insects and small vertebrates in drier habitats. Their name is derived from the long wattles hanging below their heads that become elongated when the bird is aggressive and shrink when it is threatened. Their call is a high-pitched and far- reaching “kwaamk.” They are non-migratory but may move locally due to the availability of water. 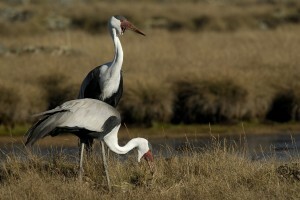 Faced with loss and degradation of wetland habitats caused by human factors – agriculture expansion, industrialization and its effects – the habitat of the wattled crane is ever declining.